General Hospital (GH) spoilers reveal Andrew “Drew” Cain (Billy Miller) is plagued by the past and the present. The Navy SEAL is stuck in limbo as he struggles to remember the past that was erased from his mind and the present that was mapped into his brain; memories that are his twin brother, Jason Morgan’s (Steve Burton). When GH fans knew BM’s character as Jason, we were all given a very disturbing visual of him choking his “son” Jake Webber (Hudson West), in a nightmare; many feeling the powers that be at General Hospital had gone too far, but little did they know at the time, “Jason”, now known as Drew was suffering from PTSD and it was a terrifying nightmare. GH sources cautions viewers that this might not be the end of such disturbing violence – in fact in upcoming new GH episodes the promo video below shows Drew behind bars after being arrested! 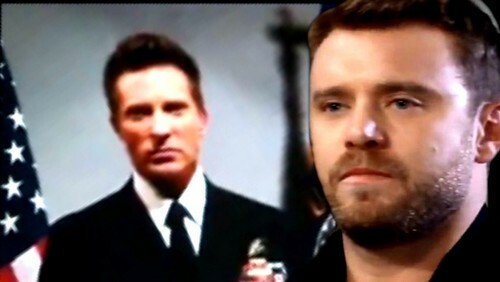 General Hospital spoilers suggest as Drew continues to search for the unknown, he will have to cope with being under Helena Cassadine’s (Constance Towers) mind control, and for those who observed closely, you will remember that she often referred to BM’s character as “my soldier boy!” Anyone who knows about Post Traumatic Stress Disorder/Syndrome (PTSD/PTSS) will know that it could be anything that triggers it, whether it be months or years later. Drew has been under immense stress lately, especially now that he feels alienated by those he felt would always have his back like Sonny Corinthos (Maurice Benard) and his BFF, Carly Corinthos (Laura Wright) or even his nephew, Michael Corinthos (Chad Duell). As viewers of the ABC soap opera saw, Dr. Andre Maddox (Anthony Montgomery) confirmed what most suspected, that Patient 6 was, indeed, Jason Morgan- meaning everything Drew had been living until that moment had been a lie, including his marriage to the woman he loves, Samantha Morgan (Kelly Monaco). General Hospital tease that Sam could be the one who is in imminent danger, as she is determined to stand by his side, reassuring him that they are in this together. Drew has shown on several occasions his anger, lack of sleep, waking up angry, confused – it looks like a supportive Sam could be his next unintentional victim, unlike Jake, who was just in his nightmare. This violence will force the two brothers to face off as we all know Jason Morgan would never stand for his beloved Sam to be harmed or at risk in any way. How will Drew cope with Jason stepping in to help Sam and will Drew finally seek the help he needs? Be sure to tune into ABC’s General Hospital (GH) to catch up on all the exciting stories happening right now in Port Charles. Check CDL General Hospital spoilers often for updates, news, rumors and spoilers!